Forgetting names and how to care for your plants? Gardenize will help you! In MY PLANTS you build your own library of plants. 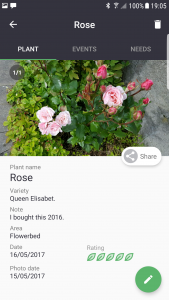 Add photos and detailed information about YOUR plants. 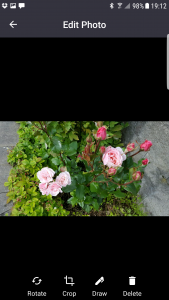 You can add as many photos as you wish, which is good if you want to know how the plant looks different time of the year. There are many information fields where you can add the information you are interested in, such as Type, Varietey, Scientific name etc. 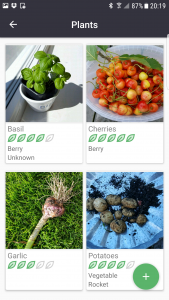 One great feature in Gardenize is that you connect your plants to your different areas in your garden. Read more about Garden areas here. You can have the same plant in several areas. To edit the information or add more photos, click on the pen in the right corner. One tip is to take pictures of the stickers and labels you get when you buy a plant or the seed bag to gather as much information as possible about your plant. 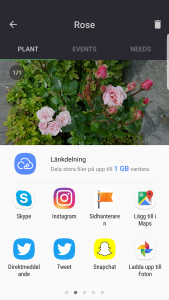 You can edit a photo – rotate, crop, draw and delete. Just enter edit mode by tapping the green pen and then tap the photo you want to edit. Save by clicking the check mark in the upper right corner. If you want you can share the photo to Facebook, Instagram or any other social media you have on your phone. Tap the sharing sybbol in the right corner of the photo you want to share. Enjoy adding all your PLANTS to Gardenize and never forget again!